NM is not only home to the native pronghorn but also hosts the beautiful Gemsbok of Africa. We hunt all over the state in search of both species. and are the best at filling these tags with 100% success. 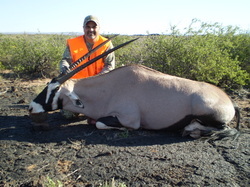 Our Oryx hunts are conducted on WSMR starting on Friday afternoon and ending on Sunday. You will want to put in with us as your outfitter for highest odds of drawing this tag. These are fun hunts and our success rates have been 100% kill success. These animals are beautiful and make exceptional trophies and you don't have to go all the way to Africa to get one. These are spot and stalk hunts and success is usually higher with rifle or muzzle loader than with a bow. But whatever your goal is we will work hard to achieve it. We conduct these hunts from Oct-Feb on either Rhodes Canyon, Stallion Range or Mc Gregor Range. Oryx numbers are down and these hunts are getting harder so practicing at longer ranges out to 400 yards will yield for better success and also practice off shooting sticks in standing position. Tags have been lowered to only 45 tags a hunt so don't go home empty handed with a once in a lifetime tag. We are also now guiding for off range hunts, these hunts can be tough but we have put the work in to find good areas that produce and have been 100% on these hunts as well. Also the draw odds are much better so if you are getting tired of not drawing a WSMR tag then lets talk about getting you in on these hunts. We usually run these hunts Nov-Feb, as its much cooler and we can hunt most of the day. We offer 4 day packaged hunts and if for some reason we don't tag out in that time being that tag is a month long you can come back for just a day rate. These hunts are done from either Las Cruces, NM or Socorro, NM. Some outfitters brag about private land to do these hunts but honestly its not needed as we use to have private land and we were more successful on the public side, so we dropped the private and in return it created a more affordable hunt not having to pay a 1000.00 access fee. Deadline to apply is March 22, contact us to help with application process, 25.00 consulting fee applies per application. Contact us to apply now! Lodging at either a hotel or camp trailer, 2x1 two people per room, 1x1 one person per room. 3 night stay. All meals, snacks and beverages from night before hunt till end of hunt. Lodging and food not provided. Expect to provide food and lodging for guide or you will be charged 150.00 a day extra. *All prices are 100% inclusive per person, including all taxes and fees no hidden costs what you see is what you pay only items not included are your license, meat processing, and trophy care. **50% is usually required to book hunt unless otherwise noted. Our antelope hunts take place all over New Mexico. We use the draw to apply in outfitter pool with over 40% success in drawing in most cases. 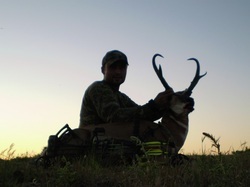 We have some great antelope hunting with average goat kills within 13-16 inches. Techniques from spotting and stalking, to decoying, to sitting blinds are all used to take down your trophy. These are great weekend hunts and success is usually 100%. You can add days for longer archery hunts if needed. Main units will be Northeastern NM 39-59 but as I mentioned we hunt all units in NM. We do have private land hunts available Click Here. Lodging at either a hotel or camp trailer, 2x1 two people per room, 1x1 one person per room. 4 night stay.